Read our customers' honest and impartial Volvo XC60 car reviews and ratings to easily find your next car at Motorparks. This is my second XC60, the first of the new styling. Ours is the entry level momentum but there is nothing 'entry level' about the specification, finish or performance. We have had it for a week now and it continues to delight with each new feature discovered. Service from Doves was first class. Fab from the off! I'm not very technically minded, but have found everything very easy to understand and I'm loving my little 'ECO' button! The car itself, was chosen for a family of 5 and as such is more than capable of giving the 3 children enough room, in the back, so as not to be on top of each other. The fabulous design of the inbuilt booster seats results in a slightly wider space in the middle, enough, we've since found, to even add a 3rd booster when the need arose! I find it pretty spacious giving it's classed, I believe, as a small SUV. Well, yes, my wife is thoroughly enjoying my new car, she says it is very comfortable, easy to drive and basically just driver friendly and is rapid without stress when needs be. My step daughter and her three year old son think it is wonderful with very good space for the requirements of a young mum and highly active little lad. My mother-in-law, who is 93, finds it very easy to get into and out of and again, very comfy. My sisters-in-law all think it is a passenger friendly vehicle and have all expressed their delight in being able to converse at normal volume while in motion. I will probably be able to confirm all this once I can beat my wife to the driver's seat. Seriously, I have had some time with it, and would judge it one of the nicest cars that I have driven and can only express my pleasure at experiencing Volvo's product. I would certainly recommend it. Great car, very impressed with how easy it is to drive. We have now had our new Volvo XC60 for just over a week. Early days, of course, but so far we are absolutely delighted with it. We still have plenty to learn in terms of all its capabilities, but it looks fantastic, is luxurious inside and is a pleasure to drive. I'd definitely recommend it. P/ex Merc 350e and was concerned I would regret going to a Volvo. However I am pleasantly surprised how much I like it, nice drive, good acceleration on 5 cylinder engine and well built. May look at another Volvo XC60 once the demonstrators are available. I am really pleased with my new Volvo and the interaction with Ben Spillard during and after the purchase has been excellent. The driving position is great and I love the interior of the car. I wanted to move towards an electric vehicle and this seems a great step. Charging the car is easy and I will be having a POD ionstalled which will speed up the process. The ability to do my short journeys into the town and locally on electric power is great. The boot accommodates my golf clubs and my electric trolley very easily with one seat down for the clubs. I am getting used to the controls but find the map very different to the Mercedes one. It will take some time to get used to all the functions on the screen. The telephone connection is very clear and the the voice activated system is much better than the Mercedes. The car feels very safe to drive and the parking assist is great. All in all a superb car. I'm loving driving the car, it is very comfortable. Accelerates well when needed, excellent turning circle. Very spacious inside with a feeling of being in a solid piece of machinery! Very easy to drive. Haven't yet got to grips with all the computer type bits and pieces! All in all I'm loving it! I have only put a score of 8 out of 10 because so far I haven't used a full tank of fuel yet, so waiting to see how thirsty it is! Absolutely love my XC60. When I first test drove it, I wasn't convinced, but my wife loved it so I went ahead with the purchase. On the second drive I was convinced - it's possibly the nicest car I've had to drive. The adaptive cruise control, auto-dimming headlights, heated seats are all amazing. My XC60 is the first Volvo I have owned and I have to say I am absolutely loving driving it. The steering is very light and responsive, the ride height and visibility are excellent. I like having the option of selecting a drive type, although I usually select 'Eco'. I find the Volvo App so handy on a cold day because I can remotely switch the engine on and get the cabin up to temperature and clear the screen. On the whole I can't find a fault with it. I no longer take shortcut routes on my regular journeys, instead opting to enjoy the drive instead, and that's really saying something. 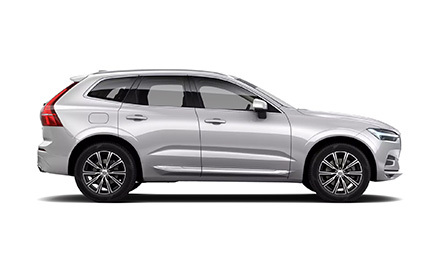 Dropping from driving my 14 year old XC90 from new, the new XC60 is a car of great quality and safety to drive as well - all Volvos seem to carry the Volvo excellent gene !! Highly recommended indeed. Thank you for your services. Been a Volvo man since the mid 70's. Wouldn't have any other. Each model has been better than the last from the 240 to 960 then a V70. Now I have a XC60. Am still learning what it can do but I am exceedingly pleased with it. I feel safe and secure in it. It lives up to all my expectations as to what a Volvo car should offer. Volvo XC60-T8 - This car was taken on a 36 month contract hire for business use. It has been in use for just over a week now, covering just shy of 1000 miles, and it has lived up to expectations. The controls and functions work just as they should and it is extremely comfortable on a long journey - a single journey can be up to 320 miles. Winter, so getting about 21 miles on battery but expect this to rise slightly in the warmer weather. It is almost impossible to detect the change over from the engine to the electric motors, there is no clunky switch over. The transition to 4wd last week in the snow was again almost undetectable other than the power indicator on the virtual cockpit, it's nice to have seen this function work so smoothly. I looked at the Mitsubishi Outlander, but was put off by the fact that this vehicle does not automatically shift to 4wd - it is a manual function, not good when the car starts to loose traction on slippery surfaces. The XC60 is fitted with pilot assist: this also works perfectly on the motorway, once you get confidence to 'trust' it. Currently getting about 44mpg in the real world, which is slightly better than the BMW X3 it replaced - that was a diesel. Doves were also great to deal with and made the change over as pleasant experience. Thanks to Hayley and Mike. We got a XC60 Volvo about 2 weeks ago. The car drives very nicely and we are very much enjoying it. We have had a few problems with the electic system: the car alarm sounding when I opened the door, the mirrors not opening when starting the car. Also, the satnav is not working, for some reason it shows the car is in Croydon - we live in Raynes Park - and every route is planned from there. I almost missed a meeting as the directions were misleading and did not make sense. At the moment I'm using an old Garmin satnav we had, but hope the agency can reset or do something about this, as this feature is very important to us. Overall the agency has been very responsive, so hopefully all will be resolved soon. Even in such a short time, the car has been upgraded and, as the old one, is a pleasure to drive, with the feeling of extra comfort for the passenger with an electric seat! The colour is magnificent, it visually changes in each part of the day, and is admired whenever we park. Well done Volvo - a winner again, it took some time to find you but with you I will be staying! XC60 drives like a limo - very smooth. Glad I chose geartronic 8 speed, cannot feel gear changes - try one! I have always loved Volvo cars but for the past 7 years I moved away from the brand. Am I glad to be back with Volvo....too true I am. My new Volvo XC60 is a beautiful drive. Smooth, great acceleration and the confidence of AWD. The interior is elegant and I love the digital dashboard with 3 different themes. Safety is paramount to me and I feel that the solid feel of the car gives me confidence every time I drive it. I am so pleased to be back with Volvo!